May buy 1 for yourself and 2 additional as gifts. May use 1 per group/visit. Appointment required and subject to availability. Valid only for option purchased. Must be 14 years or older to participate, ages 14-17 require guardian signed waiver. Closed toe shoes required. Expires 4 months after purchase. See the terms that apply to all deals. 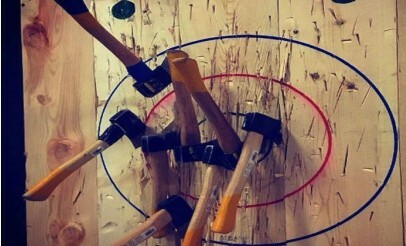 First time participants can expect to spend the first 10 – 20 minutes (depending on group size) learning the basics of axe throwing and going over safety instructions. Our instructors will then teach you how to score matches and, if desired, your group can play a casual tournament to see who will take home the ultimate bragging rights. Please note: if your group contains 8 or more people and you wish to complete a tournament, a booking of at least 2 hours is recommended.